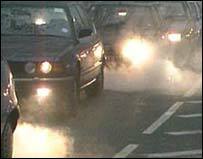 Air pollution increases the risk of cardiovascular disease, a study says. Researchers studied 66,000 women in and around 36 US cities, finding pollution levels varied between four to nearly 20 micrograms per cubic metre. The University of Washington team said each 10 microgram rise was matched by a 76% rise in the chances of dying from heart disease or stroke. It was not clear whether women are more susceptible to pollution than men, the New England Journal of Medicine said. However, women's coronary arteries are smaller and this might render them more vulnerable. For women living within, rather than between, cities, the risk more than doubled, increasing by 128%, with each step up in pollution levels. All the participants were aged 50 to 79 and part of the Women's Health Initiative, a major US investigation into the causes of heart disease in women. None of the women initially had any sign of heart disease. They were monitored for up to nine years to see which of them went on to suffer a heart attack or stroke, undergo bypass surgery, or die from cardiovascular causes. A total of 1,816 women suffered one or more cardiovascular events. Data on the women's health were compared with air pollution readings from 36 metropolitan areas. Scientists focused on tiny airborne particles called particulates, which are less than 2.5 microns across, and can lodge in the lungs. About 30 or 40 of the particles equal the width of a human hair. Normally invisible, they can be seen as dense clouds as they emerge from an exhaust pipe, smokestack or chimney, and are responsible for urban haze. It was already known that fine particulates are associated with heart disease, but earlier studies did not look at the effect of local air pollution on previously healthy individuals. Researchers said the results suggested that for older women fine particulates are far more hazardous than was previously thought. Lead researcher Professor Joel Kaufman, from the University of Washington in Seattle, said: "These soot particles, which are typically created by fossil-fuel combustion in vehicles and power plants, can contain a complex mix of chemicals. "The tiny particles, and the pollutant gases that travel along with them, cause harmful effects once they are breathed in." The researchers said it was unclear precisely how fine sooty particles might trigger heart disease, but one thought was that they accelerated the hardening and narrowing of arteries. Professor Kaufman added: "Preventing these effects requires reducing the pollution at the source." Professor Jeremy Pearson, associate medical director of the British Heart Foundation, said the study suggested the risk was "greater than previously thought". "This adds to the mounting evidence that air pollution should be taken seriously as a risk factor for cardiovascular disease. "When localised air pollution is particularly high, people with chronic lung disease or coronary heart disease should avoid staying outside for long periods."